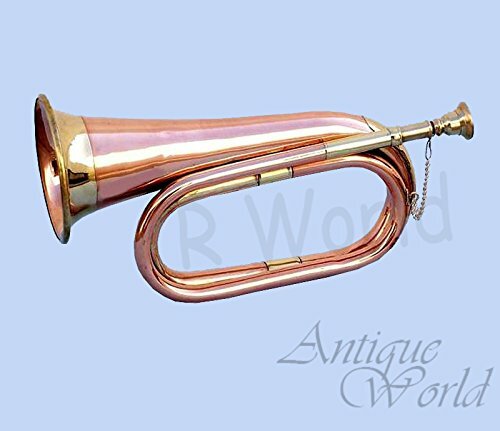 ANTIQUES WORLD CLASSIC MILITARY / BOY SCOUT HEAVY COPPER BUGLE SIGNAL HORN Item No:- AWUSAMI 0123 Size: - 11-inch (28 cm) (Approx) Description:-Classic Copper Scout / Amy Bugle with Decorative Cord,Classic Heavy Copper Scout Bugle. Top-quality. Polishing supplies and colored cord included 11-inch (28 cm) Copper Heavy Bugle. This is based on the classic Civil War army bugle, a design that has remained unchanged for years, and feels great in your hand and plays wonderfully easy. The same model is widely used by army brass bands, scouts, and school bands all over the world.